Mobile phone displays have moved on leaps and bounds since the days of monochrome screens and two lines of text, but beyond resolution increases, where might the tech go next? What will the smartphone display consist of some 5 or 10 years into the future? Engineers and experts are already working on a bunch of innovative technologies, from foldable screens to interactive displays, and here we'll lay out what you can expect in the years ahead - it certainly doesn't look like we'll be using typical flat panes of glass forever. 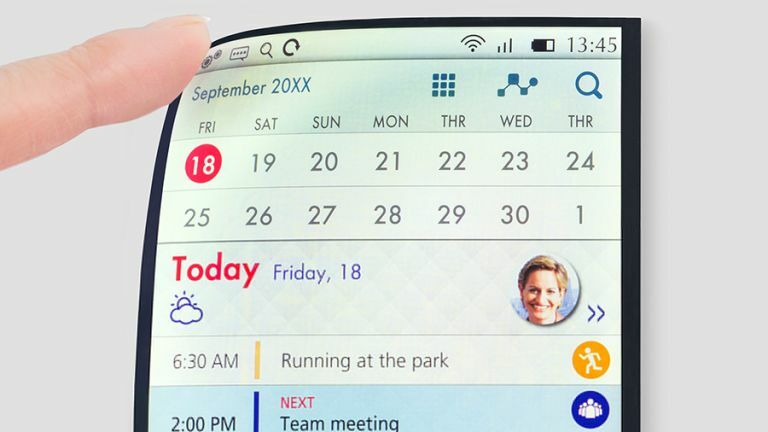 Perhaps the most well-known of the innovations heading to phone screens is the idea of a flexible display - one you can roll up and put in your pocket. These sort of screens have been talked about for years, and indeed Samsung has sold a smartphone with a curved display since back in 2014. However, these curved edges that are now a mainstay on the Galaxy series remain expensive and tricky to manufacture (which is perhaps why no one else has bothered yet). Improvements continue to be made, but they're slow - Japan Display Inc (which supplies Apple among others) recently announced it was developing a flexible display like Samsung's, but one that uses LCD rather than AMOLED technology. That's all well and good, but these screens are fixed to batteries and electronics that can't bend, so there's a way to go before we see a foldable phone. What we might see more of, this year and in the future, are curved screens and more original designs. One of the more interesting rumours surrounding the next iPhone is that it's going to make the switch from LCD to OLED technology. Both have their pros and cons but OLED (favoured by Samsung) typically offers brighter colours and better visibility in sunlight. OLED isn't particularly revolutionary, but there's speculation that Apple will very quickly be moving on to Micro-LED, a type of display that provides even darker blacks, even brighter colours, and even less battery drain than ever before. Perhaps nothing to shout about from the rooftops then, but if and when Micro-LED does arrive, it should bring with it screens that are markedly superior to their predecessors. The problem, as with any new technology, is getting it cheap enough to manufacture at scale at a cost that people are going to be happy with. A recent Apple acquisition involved a company known for its micro-LED patents, so keep your eyes open for it appearing on a future iPhone or iPad. Something that both Apple and Samsung have been tipped to introduce in the near future are phones covered entirely by a display - and that means electronics like fingerprint scanners and home buttons will need to be embedded in the glass itself. We've already seen Apple's 3D Touch technology push the boundaries of what can be done with a flat pane of glass and it looks likely that there's more to come: more sensitivity under the display and more in the way of integrated electronics underneath it, whether that's an iris scanner or a pressure-sensitive heart rate monitor. Expect improved 3D Touch-style tech and haptic feedback too, so phone displays that are more sensitive to touch and can touch the user back as well. We're already seeing the early signs of this in phones and wearables and improvements will come along quickly. Ultimately there might be very little that can't be integrated into a seemingly ordinary slab of phone display glass to give our phones extra superpowers. Like flexible screens, holographic displays have been in development for a number of years, but manufacturers are still struggling to get the technology cheap and reliable enough for the mass market. With the right combination of cameras and miniature projectors, a holographic smartphone is very much possible today, at least as a prototype - but whether it actually has a practical use on a smartphone is another matter. Right now the experiments going on in laboratories across the world don't stand up particularly well to the latest flagship phones on the market, but it's still early days for the technology, and it's already showing plenty of promise. Within the next few years it's very possible that phone displays will function both as traditional flat panes of glass and as 3D holographic projectors, with different modes used for different apps and purposes - just don't expect the first phone that arrives sporting the tech to be a cheap one. Another recent innovation that's gaining momentum is the solar-powered screen, developed by the likes of Kyocera and Sunpartner Technologies. The beauty of the technology is that the solar panels are built right into the screen, but to the naked eye (and naked touch) they work just like normal displays. Imagine a smartphone display that doesn't lose battery power when you're out of the home but actually gains it. Manufacturers could fit smaller batteries, meaning phones that are even thinner and lighter. Right now though it's all still at the prototype stage, and again companies are working out how to make the technology ready for consumers. With so much research and investment into solar power though, we're hopeful that we'll see big steps forward pretty quickly. Solar power could also be used to run an always-on display, so the time and various notifications would always be visible. Those are just some of the innovations on the way, but there are others in the pipeline, covering virtual reality, transparency and more. One day the smartphone displays we use now are going to seem very old-fashioned indeed.